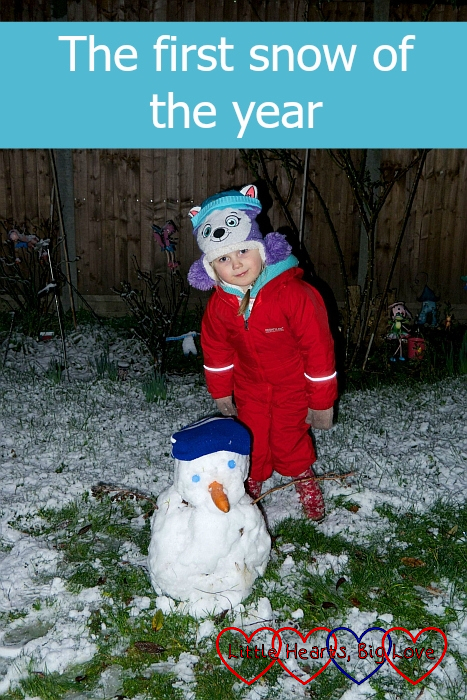 I still remember the excitement of the first snow of the year as a child. Would it settle? How long would it last? Would we get any more? Sometimes that first snow was the only snow of the year. Some years we didn’t get any at all. One thing was sure – you had to make the most of it while it lasted! The snow started to fall just as Sophie came out of school, much to her excitement. I was sure it wouldn’t settle. It was too wet, I said. But it was still fun for her to come home in it, to see the snowflakes landing on her coat and hat; to try and catch them on her tongue. By the time we got indoors it had stopped. By bedtime, I’d forgotten about the snow. 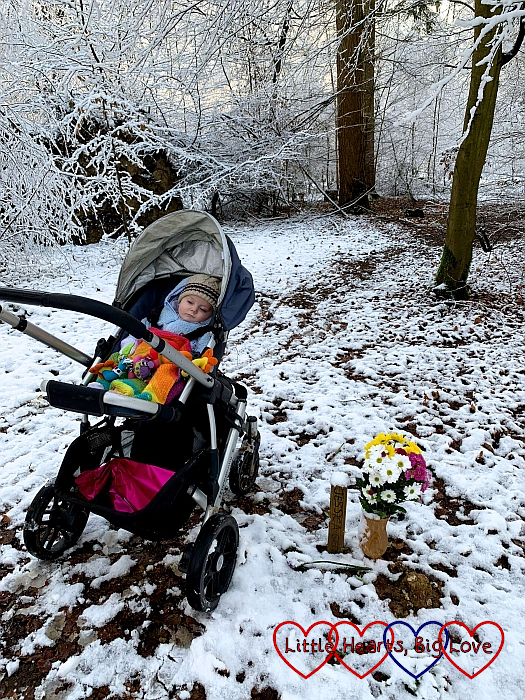 Thomas was having a nap, Sophie was in her pyjamas tidying away the toys and I was scrolling through social media when I spotted a snowy pic posted by a friend who lived locally. A peek through the curtains confirmed it. We had snow! Yes, it was bedtime, but it might all be gone by the morning. 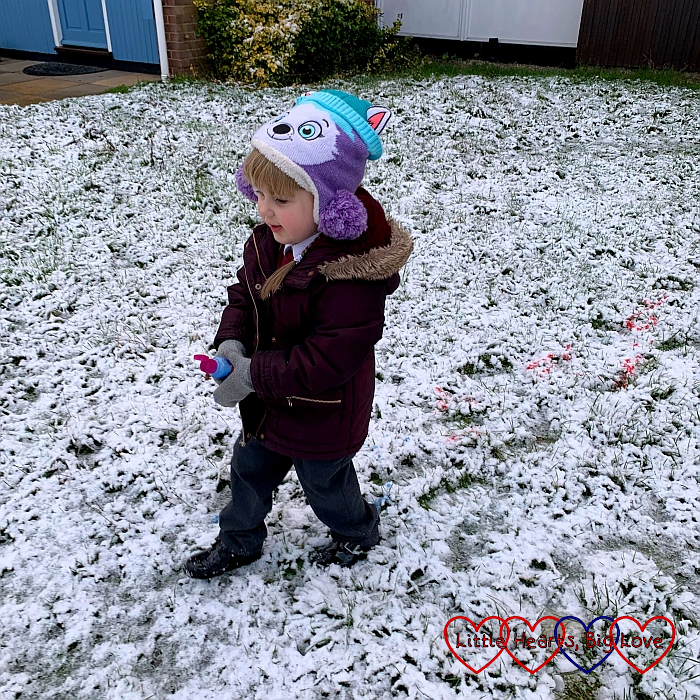 Sophie threw on a cardigan and socks, got into her puddlesuit, hat, gloves and wellies and we headed out to the garden, keeping an ear open for Thomas, ready to come back in if he woke up. It was dark but the light from the open kitchen door was enough to see by. 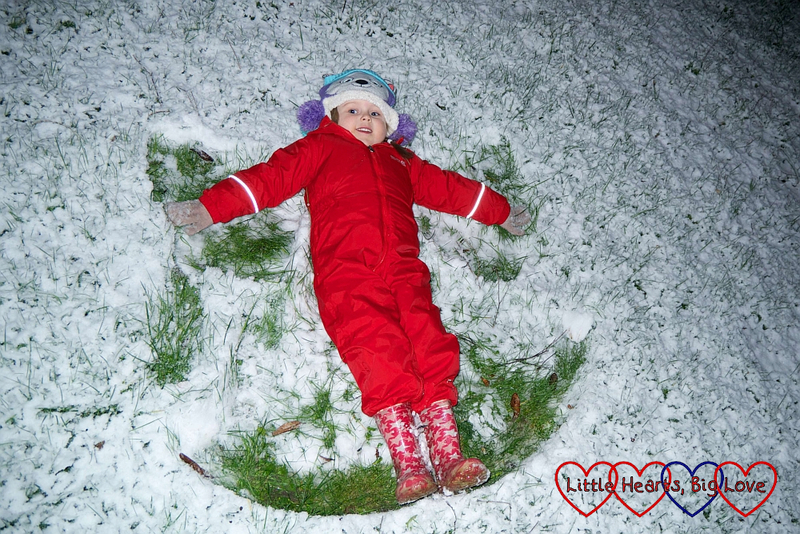 Sophie started off by making some snow angels. It reminded me so much of Jessica doing the same last year. We had fun rolling up some big snowballs to make a snowman with a carrot nose and blue button eyes. Sliding down the snow-covered slide was fun too. 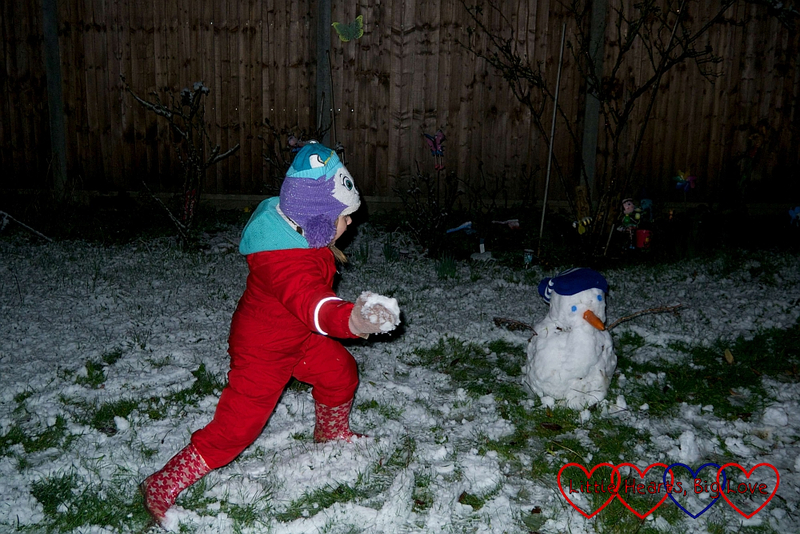 The snowman became the target for a few snowballs. It made me feel so sad that there weren’t two little girls out in the snow together to have a snowball fight with each other. I did have a brief snowball fight with Sophie, but I don’t think it was as much fun as it would have been with her sister. 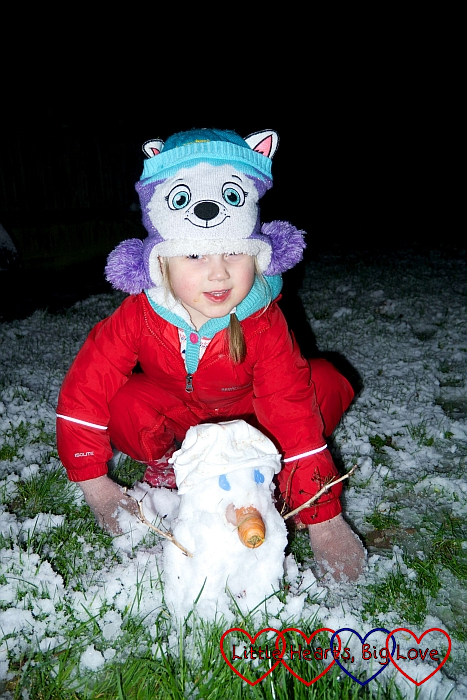 Sophie wanted to make a second snowman. We had just enough time to make a baby one, wearing a hat that Thomas had outgrown, before he woke up and we had to come back in. Sophie was very happy to see the snow was still there in the morning when she woke up. It was a good motivator for her to have breakfast and get dressed quickly so she would have some time to play in it before school! This time, Thomas came out too, for his first experience of snow. 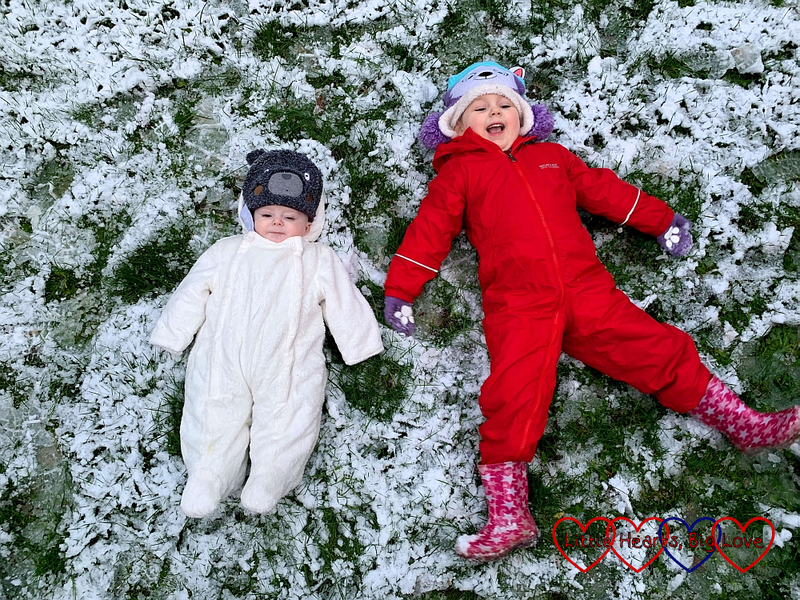 He didn’t seem too sure about the cold white wet stuff but didn’t mind too much about having a snow angel photo with Sophie. The girls both enjoyed snow painting last year. We had just enough time before school to do a little bit of snow painting on the front lawn. Once Sophie was at school, I headed over to GreenAcres to visit Jessica’s forever bed. It was like stepping into Narnia. 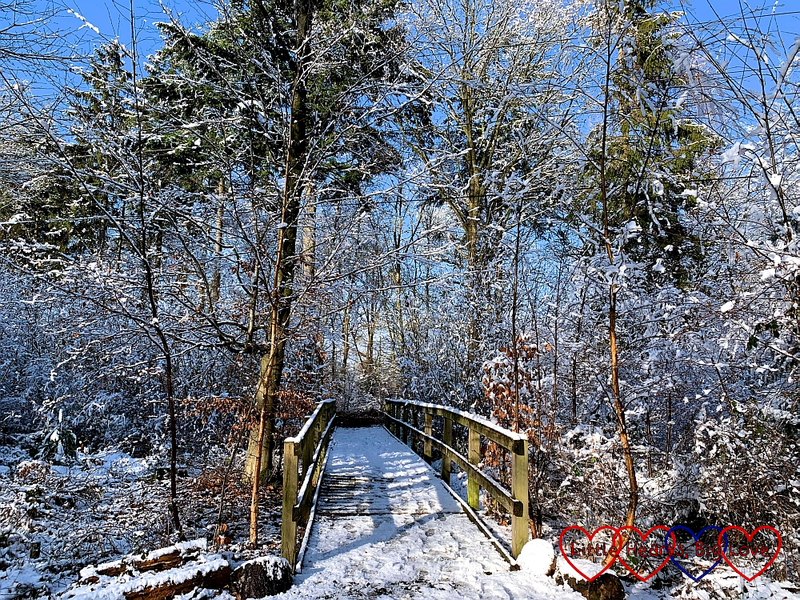 The woods looked so magical in the snow. 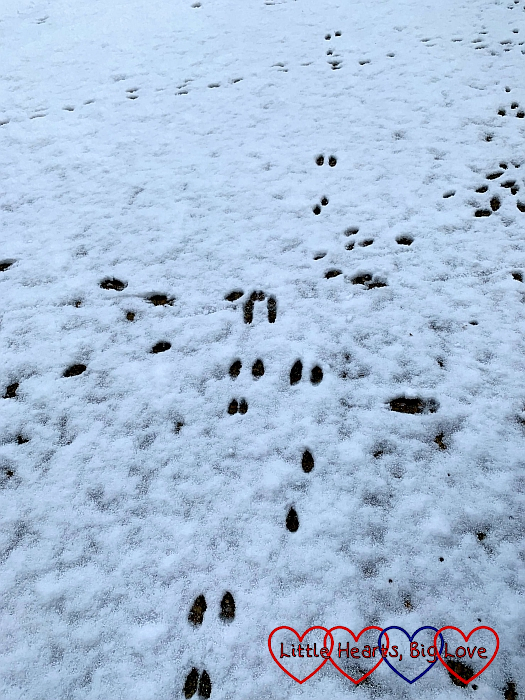 I spotted a few animal prints in the snow – fox paw prints, rabbit tracks and deer hoof prints. We suspect the deer which wander around the park enjoy eating Jessica’s flowers. I often find just the bare stems in the vase when I bring fresh ones! Her forever bed is such a beautiful spot. I wish we didn’t have somewhere like this to go, but as we do, I am glad that we found such a beautiful and peaceful place to lay our beautiful girl to rest in. It makes it a little more pleasant to visit. I like to spend time talking to Jessica when I visit her. I tell her I love her, how much I miss her, sing to her and talk about what we have been doing since I last visited her. This time, it felt right to read the poem that her godmother read at her burial. 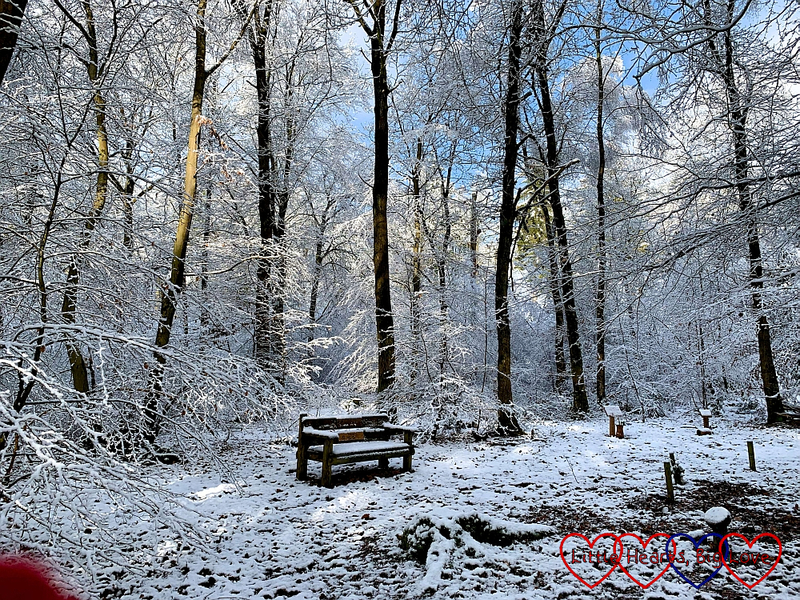 It starts with the words, “under a blanket of fallen leaves, safe in the hush of the whispering trees, I have come home.” With “snow” substituted for “leaves”, it felt so very appropriate. 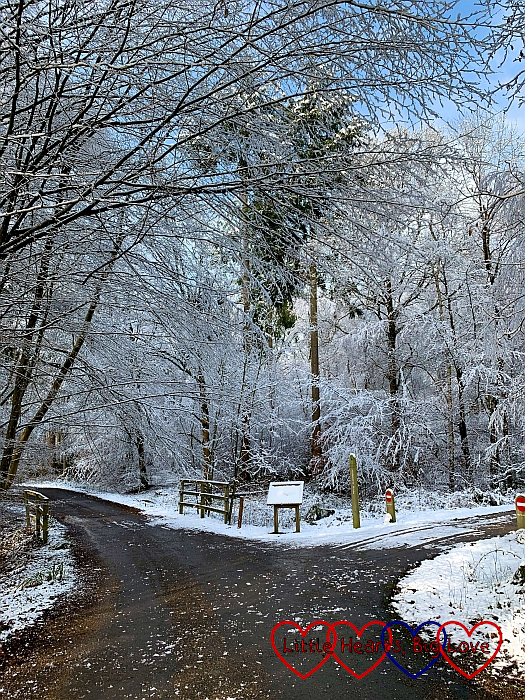 The snow was already disappearing as I left GreenAcres. 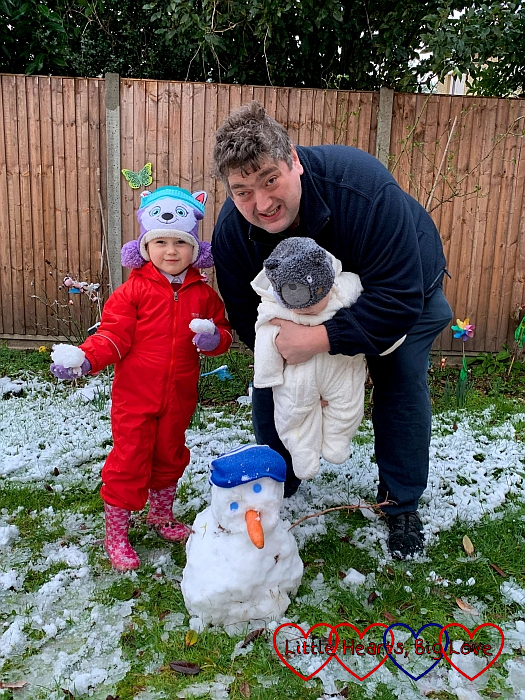 By the time Sophie got home from school that afternoon, it was gone, leaving just the two snowmen in the garden to slowly melt away over the next couple of days. 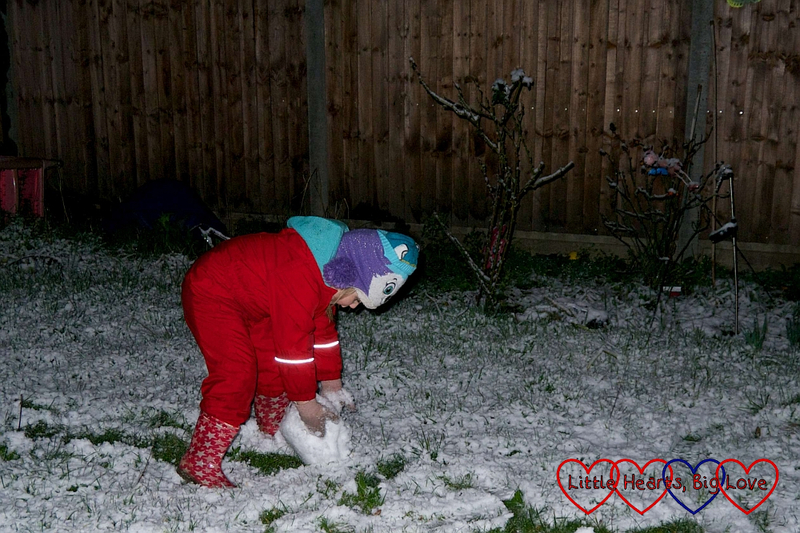 Oh Louise, you’re the best kind of mummy letting Sophie go outside and play in the snow even though it was bedtime. I bet she was delighted! How nice that Jessica’s forever bed is somewhere so beautiful and that the deer enjoy munching your flowers. Thank you Nat, what a lovely thing to say. 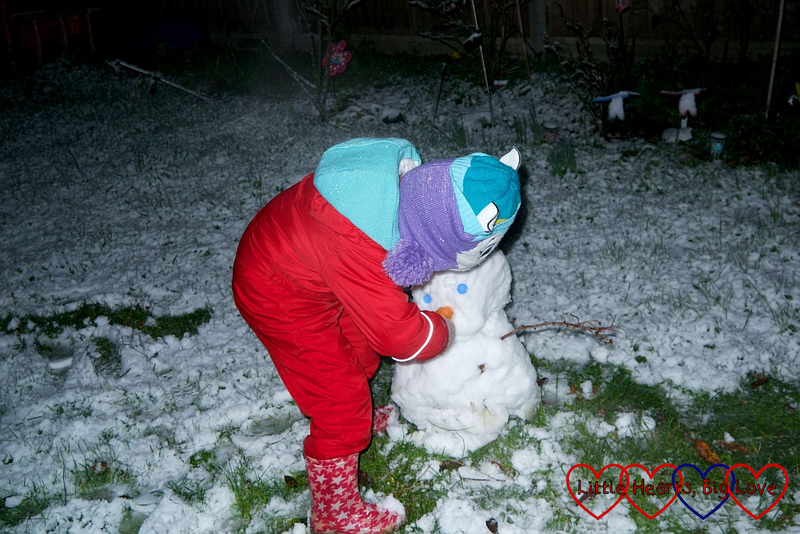 I couldn’t resist the opportunity to have fun in the snow – I wasn’t sure if it would have melted away by morning! Jessica’s forever bed is certainly a beautiful spot and the deer certainly enjoy the flowers we leave there! Ahh! You do right making the most of the snow while you have it. We had a light dusting a couple of weeks ago but nothing since! It looks like Sophie had a fab time! 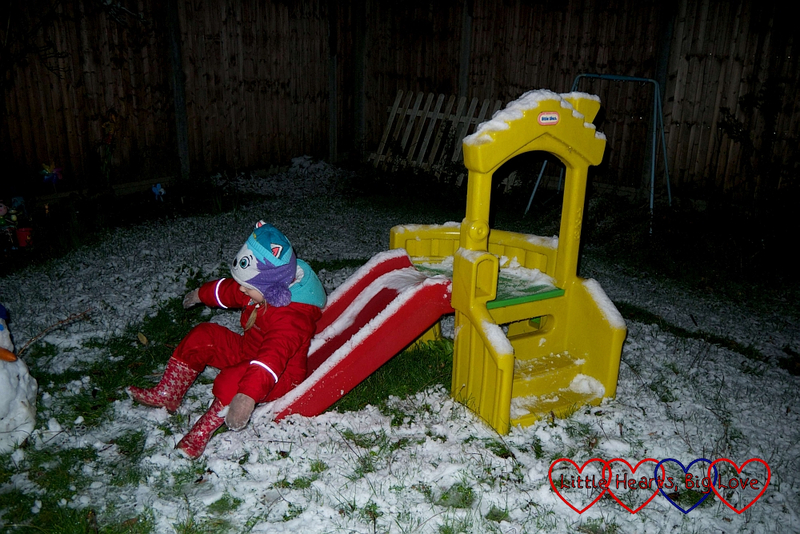 Snow is just so exciting when you are little isn’t it? I was really happy that we were able to sledge today with my husband as he always has to work on Snow Days.